Portrait of Filippo Castagna. Right: Obverse and reverse sides of the ‘Malta Blockade’ medal (Photos courtesy of Alexander Cachia Zammit). In the article ‘Was the real Vitale depicted on stamp?’ (The Sunday Times, March 18), I had queried the identity of the person shown on the 50c stamp in the Maltese personalities set issued on October 18, 2002, which allegedly depicted Emman­uele Vitale (1759-1802). My argument was that the person on the stamp is wearing a uniform of one of the military branches of the armed forces of the Order of St John in Malta, when Vitale was never a member of the Order. Having delved further into the subject and searched in numerous publications, I finally found a likeness of Emmanuele Vitale in one of the portrait galleries on the back pages of one of an issue of Heritage, An encyclopaedia on Maltese culture and heritage, published by Midsea Books. From what is shown of Vitale, he is depicted wearing a coatee (jacket) similar to that worn by officers of the British Royal Artillery in 1797. The blue coatee, which also closed over the chest in a double-breasted style, was cut away at the front. It had crimson lapels, collar and cuffs decorated with gold lace. The gold lace on Vitale’s lapels is grouped in twos with buttons on the outer ends. Portraits of Filippo Castagna and some other Maltese commanders of the Battaglioni del Casale show them wearing a uniform of this pattern with slight differences or licensing. 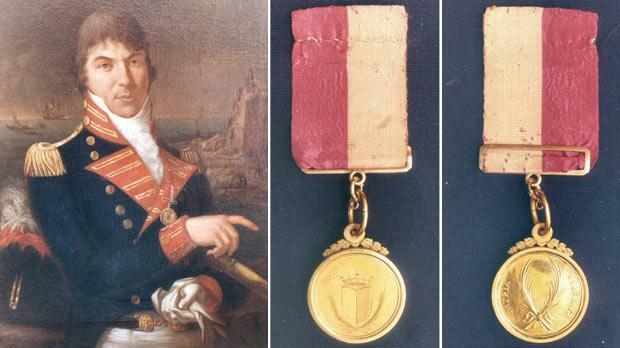 Vitale is also shown wearing what is more commonly known as the ‘Blockade Medal’ suspended on a red and white ribbon of the Maltese colours. The medal was engraved and consisted of a crowned white and red coat of arms of Malta, flanked by palm branches, while the design on the reverse consists of two palm branches flanked by the motto ‘Patria liberata’. It would be interesting to learn where this likeness of Emmanuele Vitale is kept and whether it shows his entire uniform in greater detail.